Suzanne Yoculan and the Georgia Bulldog Gymnastics Team won their fourth consecutive National Championship tonight in Athens. 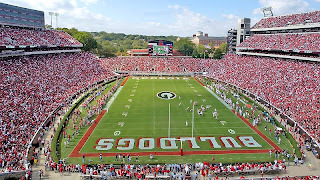 It was the first time I had ever seen Georgia win a national title in person despite the multiple opportunities to do so over the years. Georgia dominated the meet from start to finish. Utah made a late surge in the sixth rotation to close the gap, but it was too little too late. I'm not Gymnastics Guru by any stretch of the imagination, but I have to tell you how impressed I was with Katie Heenan. I'm pretty sure that she was the girl who suffered a massive face plant during a mid-spin move on the uneven bars only to shake it off and follow it with a 9.95 on the balance beam. Damn impressive. -- Upon the Gators finishing their night with the fifth rotation, and realizing they were out of it. "Tebow can't save you now." -- Upon watching the Alabama team walk around in circles waiting the outcome of the meet. "I'm not sure they have the math skills to realize they're going to finish in last place." -- "I love gymnastics. It's an opportunity to bark at women without being sued for sexual harassment." I'm sure the Athens Banner Herald will have tons of coverage tomorrow morning. But I'm heading to bed now and I'll be out of town all morning. I was there last night as well, and the atmosphere in the Coliseum while Georgia was on the balance beam was electric. Kudos to the Utah fans for being upbeat and energetic even when it was out of reach. Seeing the Dawgs win a National Title in person was special, as you said. I also enjoyed seeing the brand spanking new "2008"s on the mens' basketball banners.